The word FREE can often conjure up the idea of something being worthless; for many years the VST world has been filled with worthwhile FREE plug-ins yet Pro Tools users have often felt a little left out of the FREE plug-in world. However, there seems to be a growing collection of FREE plug-ins for Pro Tools AAX and RTAS that are well worth investing your time into. Reaktor 6 is one of Native Instrument's flagship products and NI Reaktor Player is a great way to explore the almost limitless potential of this modular synth design. Native Instruments include two free instruments Blocks Wired and Mikro Prism. BLOCKS WIRED is a set of three pre-patched modular synths created with REAKTOR Blocks and is designed to get you creating new and unique sounds quickly – from sequenced melodies and basslines to out of the ordinary textures, the world of modular synthesis comes to you in a playful and instantly musical format. MIKRO PRISM is a free instrument, based on the Native Instruments REAKTOR PRISM synthesiser. Using the same sound engine as its bigger brother and REAKTOR’s dynamic 'Modal Bank' technology, this fully-playable instrument shines with a stunning range of brilliant sounds. A one oscillator, one filter, single envelope synth, Podolski has been around for several years in different incarnations. Basically a cut-down version of FilterscapeVA with just one oscillator, one filter, one envelope and two LFOs, it also features a Zebra-style arpeggiator/sequencer plus chorus and delay effects. Podolski's specialities are the Click parameter (emphasises the filter attack) and its ability to seamlessly morph between three waveforms (WaveWarp). Zebralette is just one of its bigger brother's Zebra2's oscillators but you have everything you need to make some pretty amazing sounds. Should you eventually decide to upgrade to Zebra2, sounds that can be directly loaded into Zebra2 later, and U-he reckon that you will already know everything there is to know about the oscillators – which is quite an advantage! Zebralette has two LFOs (one per voice, one global), a multi-stage envelope and three onboard effects (chorus, EQ, delay). There are also Zebra2's dual spectral effects, which include several squelchy filter algorithms. Xpand!2 - Multitimbral All-In-One Workstation utilising multiple sound generation engines. Sometimes it can be easy to miss the wood for the trees, Xpand2 is sitting on about 99% of Pro Tools installs and yet is so often overlooked by those looking for great sounds. 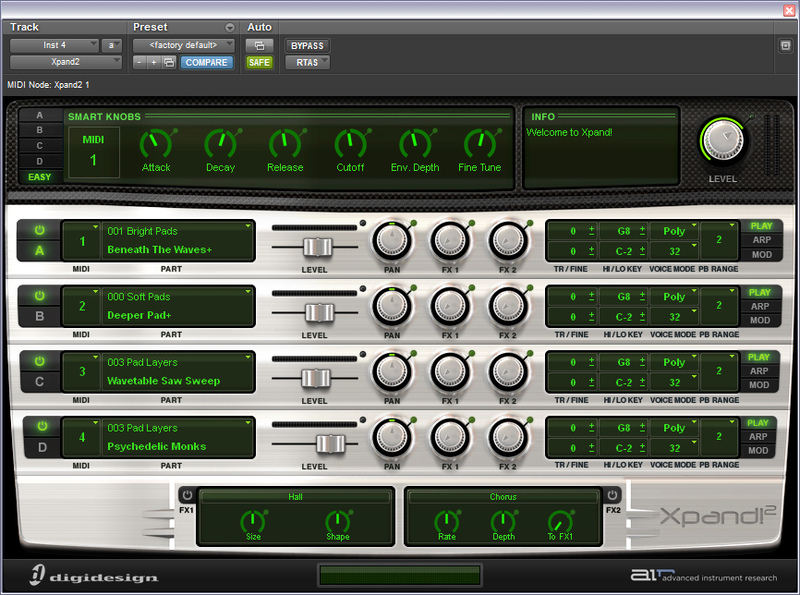 Not only is Xpand2 a great sampler it also has basic sound sources to be able to create sounds from scratch. Take a fresh look at Xpand2, you may be surprised how useful it is. Mac and PC, AAX Native. Another plug-in that ships with Pro Tools is the mono synth Vacuum. It has excellent potential for mono leads and deep rich bass. It features 2 oscillators, extensive envelopes and filters and is not a plug-in one should overlook when making synth based music. Mac and PC, AAX Native. Where Do I Get The Creative Collection From? Pro Tools users can log into their Avid Master Account. Pro Tools 12 users should download the appropriate installer from the Plug-ins section. For Pro Tools 11 use the installers listed in the Legacy section.